For the second straight year, the Trump administration does not acknowledge the LGBTQ community in World AIDS Day statements. Vice President Mike Pence's speech on Thursday honoring the 30th anniversary of World AIDS Day quickly drew criticism — not for what he said, but for what he didn't say. In remarks at the White House, Pence did not mention the gay community, just as President Donald Trump did not mention it in his World AIDS Day proclamation last year. Former Presidents Barack Obama and Bill Clinton each mentioned the disease’s disproportionate impact on the LGBTQ community, while George W. Bush also failed to note the relationship between gay people and HIV/AIDS in his official statements on the day. Since 1988, World AIDS Day has been observed on Dec. 1 to raise awareness of the disease and commemorate those who have died from it. Of the estimated 38,500 new HIV cases in the U.S. annually, nearly 70 percent are gay and bisexual men, according to the Centers for Disease Control and Prevention. Scott Schoettes, who leads the LGBTQ advocacy group Lambda Legal’s HIV Project, called Pence's speech "short-sighted and biased." “It’s hard to see how you can actually address HIV in the United States without talking about the populations most affected,” Schoettes told NBC News. 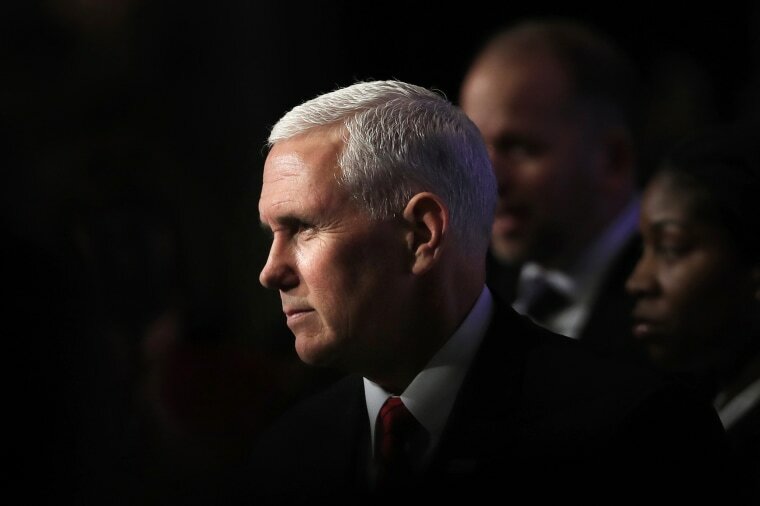 Gabriel Arkles, a senior staff attorney at the ACLU's LGBT & HIV Project, said Pence's speech was "another example of the Trump/Pence administration attempts to ignore the existence of LGBTQ people." While Pence did not mention the toll HIV and AIDS has taken on the LGBTQ community in the U.S., he mentioned several times the impact it has had on communities in Africa. He also mentioned Ryan White, a young boy from Pence’s home state, Indiana, who in 1984 contracted AIDS following a blood transfusion. While Pence lauded the Ryan White CARE Act during his speech — which he noted “continues to provide vital medical services to more than 1.1 million people in the United States living with HIV” — he had a much different view of the legislation two decades ago when he ran for Congress. This last sentence has been interpreted by some to indicate Pence's support of so-called gay conversion therapy, something Pence has recently denied supporting. While he did not mention the LGBTQ community, Pence said the word “faith” 27 times in his speech, according to a transcript of his remarks posted on the White House website, and credited “faith-based organizations and faith communities” with leading the fight against HIV/AIDS. Pence announced during his speech that the Trump administration would be increasing its funding to faith-based groups by a third. “I’m pleased to announce that our administration will invest $100 million in new resources to expand our engagement with faith-based organizations and communities of faith that are on the front-lines of the fight against HIV/AIDS,” Pence said. Pence also announced that Trump will sign legislation extending the President’s Emergency Plan for AIDS Relief, or PEPFAR, a bill originally signed by Bush in 2003, for five more years. The program has helped millions of people around the world, primarily in Africa.